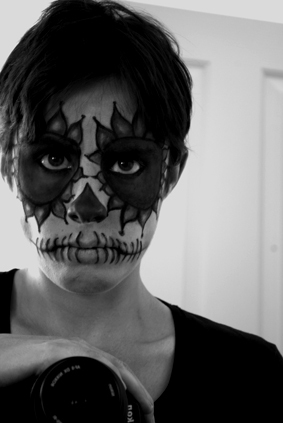 At the beginning of the year, I explored a range of inspiring, black and white makeup designs featuring the human skull. The post featured my favourite design and I briefly discussed certain patterns or styles that I find particularly inspiring. 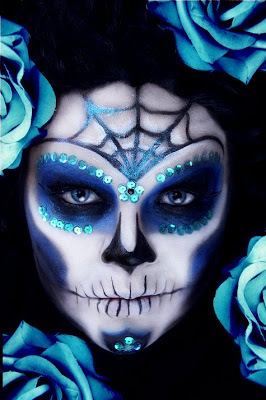 Today I thought I would briefly analyse five different sugar skull makeup designs that I admire; this task has been rather challenging, as there are so many fantastic styles or designs online. Before we get started, I thought I would briefly mention the cultural associations related to the sugar skull face painting. Since 2012, I developed a fascination for the Mexican Day of the Dead Festival including the sugar skulls that have significantly increased in popularity within contemporary art and popular culture. 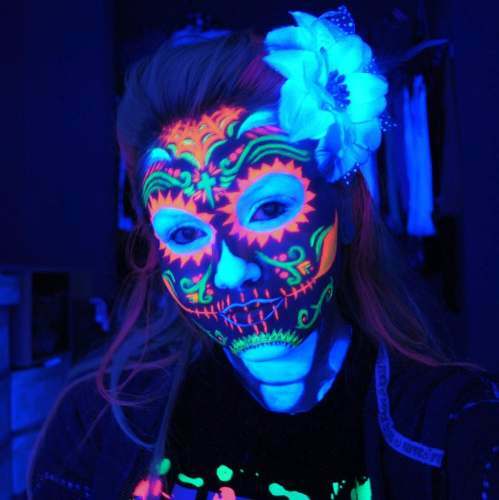 I decided to conduct some additional research online, where I discovered hundreds or even thousands of photographs featuring various sugar skull make up designs. According to Elizabeth Carmichael and Chloe Sayar, these vibrant, hand crafted sugar skulls are designed for the Mexican Day of the Dead Celebration, an annual tradition featuring a range of activities, decorations and memorials that welcome the ‘departed souls.’1 The Day of the Dead is often celebrated on the 1st and the 2nd of November that reflects both European and Pre Hispanic traditions, as referenced by David Carrasco and Scott Sessions in The Daily Life of the Aztecs.2 I began to question the growing interest in the sugar skull makeup, why do we paint a skull onto our face? 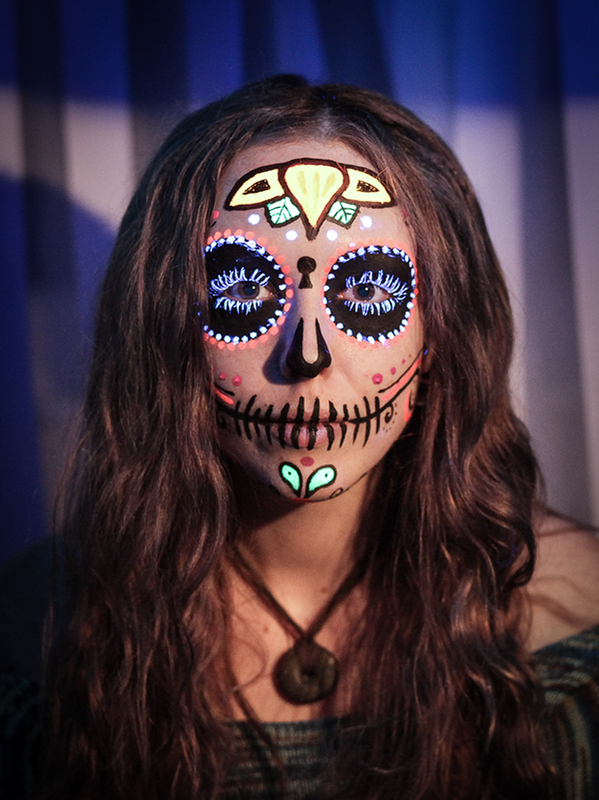 and why do we choose sugar skulls as the primary design? This is their most distinctive quality, the sugar skulls are colourful, vibrant and creative; they provide a positive approach to death and the designs have deeply inspired various cultures from around the world. 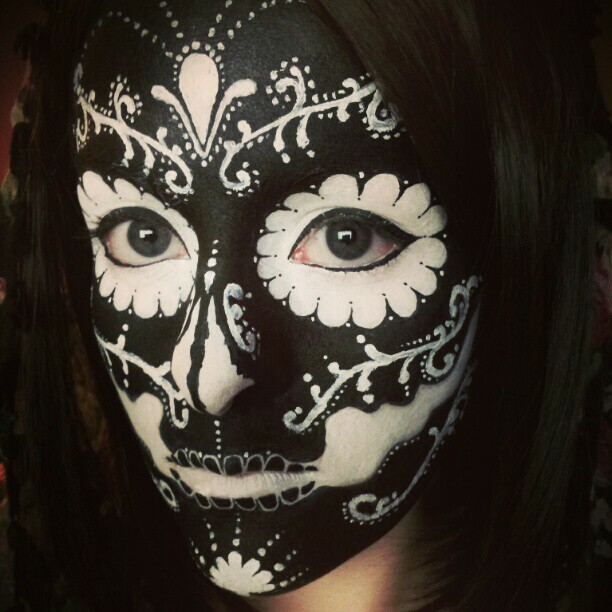 So here are my five favourite sugar skull makeup designs, enjoy! 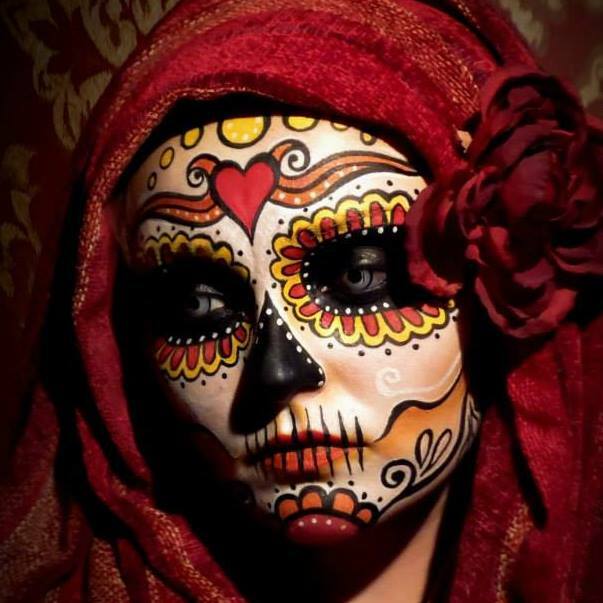 As soon as I conducted my research into the sugar skull makeup / face painting, I was instantly inspired by this particular design. 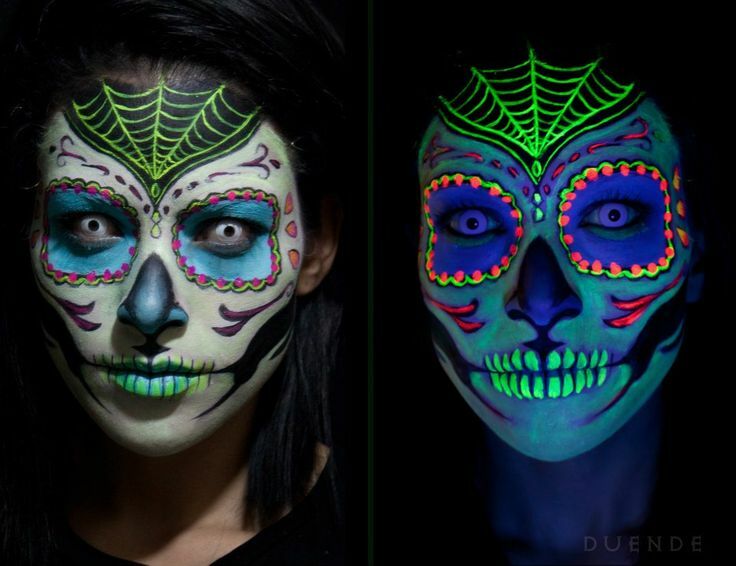 Blair Eacret and Akins Hughes have created an inverted skull and the overall style is very unique compared to the other sugar skull patterns that I have discovered online. The dark lines or patterns significantly contrast with the bright, vibrant colours; these particular elements successfully create a very striking design. The yellow and the red just compliment each other perfectly and the dark outlines exemplifies the circular patterns around the eyes, chin and forehead. 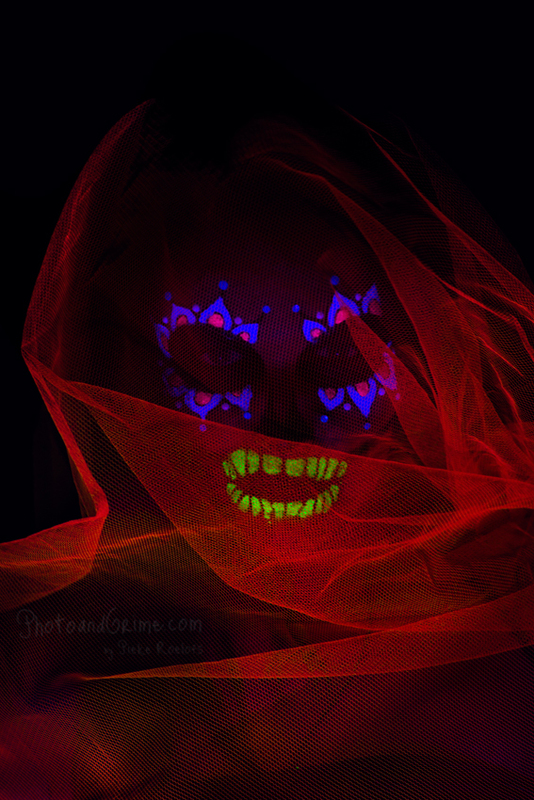 While the design is beautiful, the eyes or the pupils feature a sinister appearance, which provides a very unique composition. 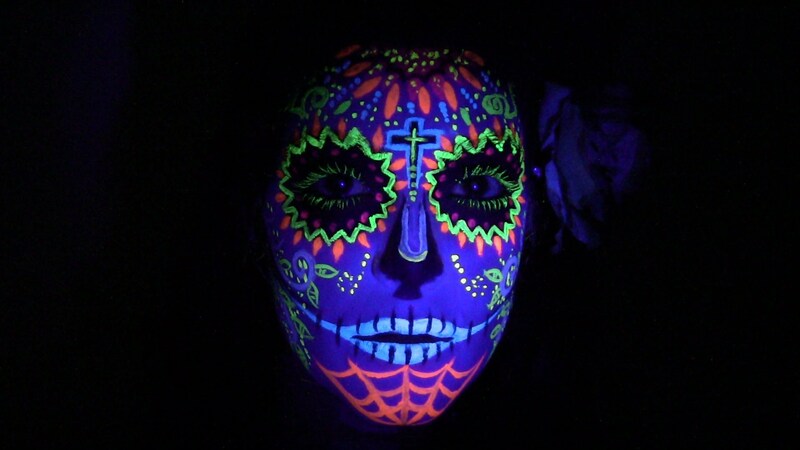 This is one incredible, yet colourful sugar skull design by Lindsay Hancock who has created a very instructional video tutorial in regards to the overall style. Hancock is a professional makeup artist and stylist from Los Angeles with an extensive modelling portfolio, as referenced by Hancock’s website.6 As I continued to watch the sugar skull tutorial, I was amazed by the different tones, pigments and gradients; they definitely add a very interesting dimension. 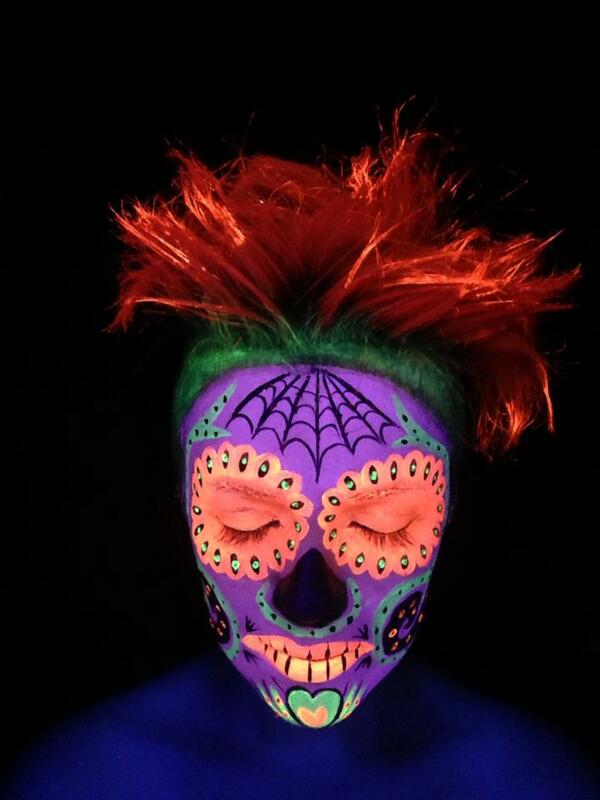 The final result is very impressive and the photo shoot presents a very shiny complexion that compliments the colourful sequins around the eye sockets and the wig. 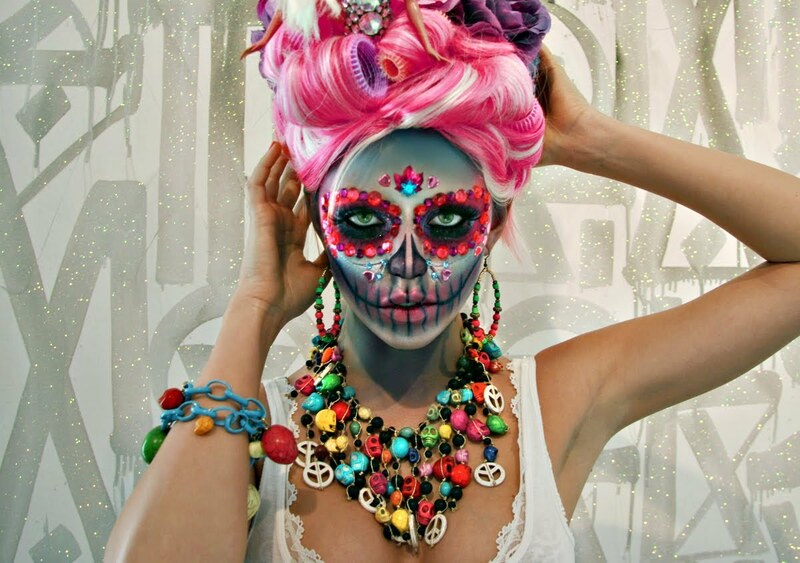 This is properly the most colourful sugar skull I have encountered and the style does remind me of a Barbie doll or Nikki Minaj. In one of the photos, Hancock stands in front of a bright, purple backdrop covered in glitter, although the colours are very overpowering at times; In my personal opinion, the makeup does work really well against a white / silver backdrop. 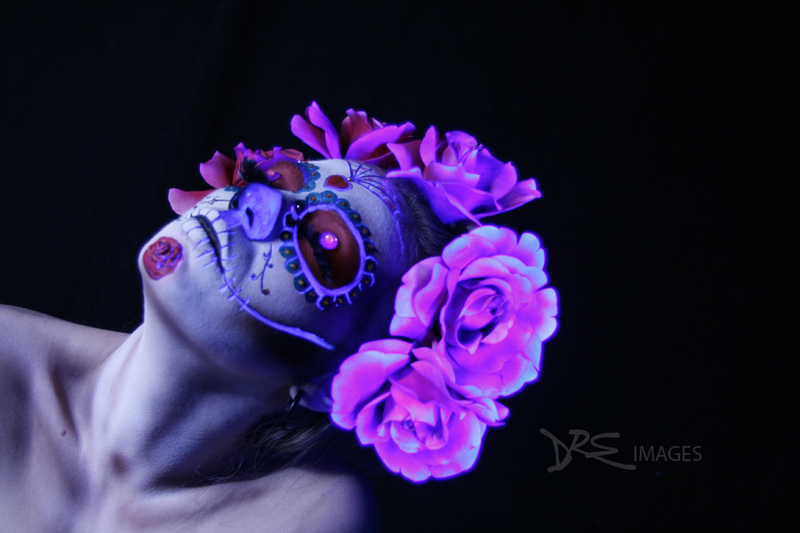 Overall the tutorial, the photo shoot and the final result features a very distinctive and eclectic representation of the Mexican sugar skulls. The patterns and the gradients are very smooth / refined and the elements contrast with the monochromatic colours and the dark backdrop. There are shadows along the model’s cheekbones that definitely adds definition to the design, the actual shape appears relatively similar to the human skull. This is a very fascinating campaign that has inspired me to try the tequila for myself. Last by not least, I present a very informative, yet interesting sugar skull tutorial by Jangsara. The site presents a list of instructions in regards to the shading, the definition and the decorations. The design is minimal compared the other styles that I have researched, although the shading around the cheekbones does remind me of the human skull. The actual shape appears similar to the skull, although the sequins do add a decorative element to the design. 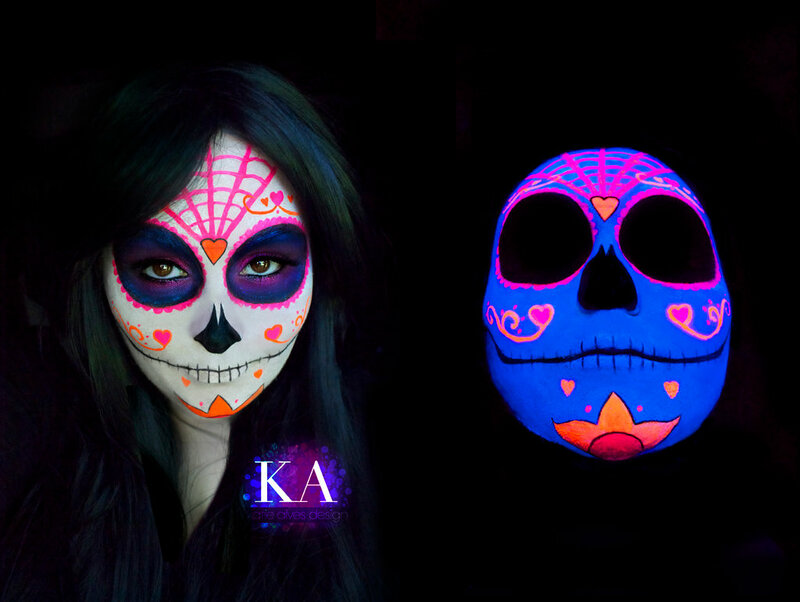 Overall, these are my favourite sugar skull makeup styles and the decision was incredibly challenging, as there are so many impressive designs to choose from. I’ll intend to create an additional post with all the sugar skull designs that I have recently discovered over the past few weeks. 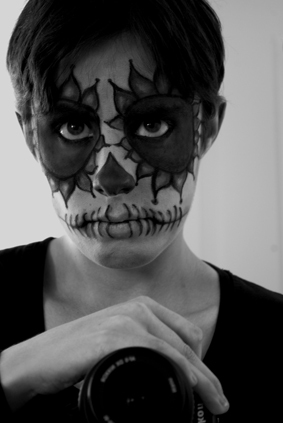 It would be interesting to research some male sugar skull designs as well in order to create some variation. I hope you enjoy the post and stay tuned for further updates. 3.DeMello, Margo, Faces around the World: A Cultural Encyclopedia of the Human Face, (California ABC – CLIO, LLC, 2012), p. 58-60. 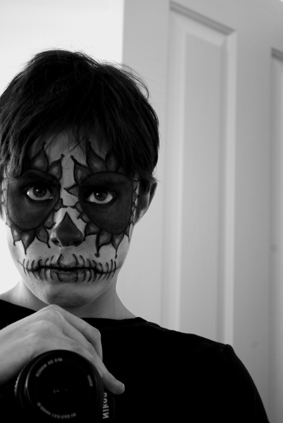 Since the very beginning of 2012, I’ve been particularly inspired by the black and white skull makeup and I’ve decided to write a short review / article in regards to five different designs that I’ve discovered online. I decided to search for various makeup designs as a source of inspiration for my upcoming project and I’m aiming to create my own personal style. I’ve often wondered the signification behind the skull makeup and whether it’s possible to find a connection to death. 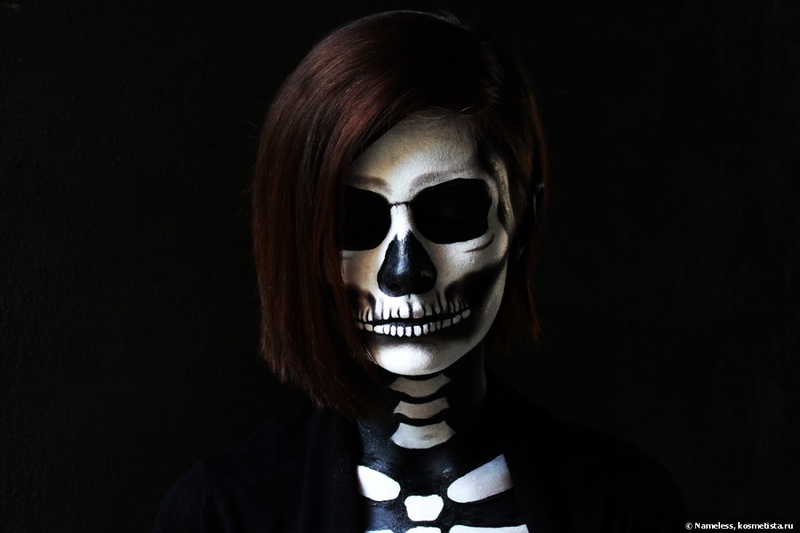 Is the skull makeup just a popular trend or are we searching for a personal association to immortality? I always find this such a difficult question to answer, as everyone will have their own interpretation. From a personal perspective, death doesn’t have a right or a wrong answer and I am interested to explore the way death or the human skull is interpreted / perceived within the contemporary culture. In the next upcoming weeks, I intend to explore some of these concepts including my own personal interpretations of death through the application of black and white makeup. Without further ado, here are my favourite makeup designs featuring the skull, there are so many different patterns / styles that I admire, although I’ve decided to narrow these choices down to my top five favourite designs. 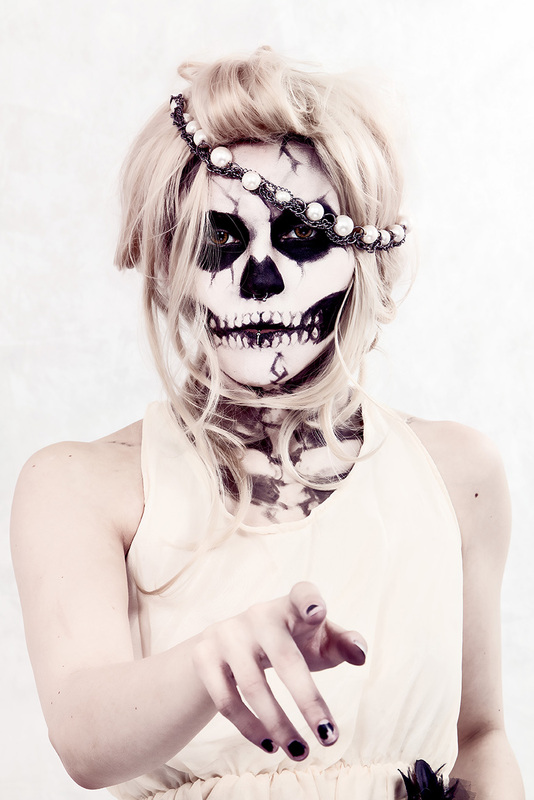 This is definitely my favourite makeup style and the golden skull is very inspiring and compelling. Paulina Misery has created an online makeup tutorial that provides some step by step instructions for the golden skull makeup design; this was inspired by a YouTube video tutorial by Goldiestarling, known as ‘ BEAUTIFUL DEATH: 24 Karat Skull Makeup.’ While the videoclip is very informative, I do prefer Misery’s makeup style and the skull is refined through the use of Kryolan Supracolours that provide an incredible complexion / consistency. I’m impressed with the photography and the dark cloak successfully contrasts with the golden, metallic skull within the centre of the image; unfortunately I was unable to find the name of the photographer but I’m sure there’s a way to find out. The dark eye sockets, nose and jaw provides the overall makeup design with a very interesting effect or dimension, although the golden, metallic complexion immediately captured my attention. From a personal perspective, the eye sockets are relatively small and the nose features a stylised appearance, although I personally believe that these particular details provide authenticity to the work as well as a unique, distinctive style. For further information, please click on the link at the bottom of the post in order to view the tutorial. 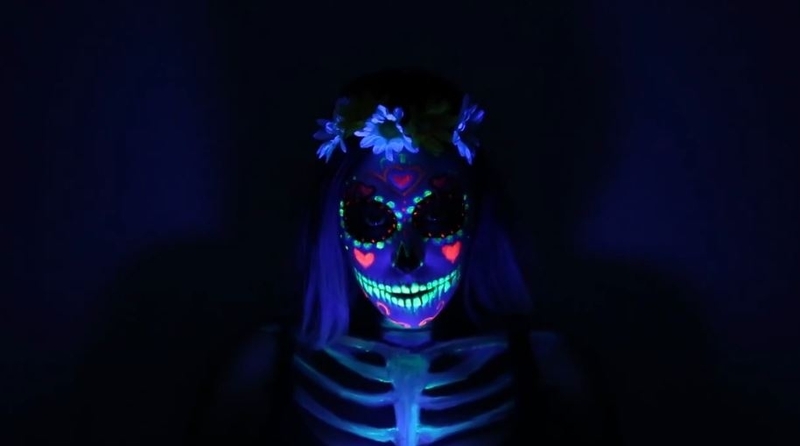 Emily Benitez has created a ‘skeleton makeup tutorial’ on Youtube that is very informative and easy to follow. The fluorescent highlights, the glitter and the cracks in the forehead are my favourite aspects of the design; these particular elements provide a stylised, distinctive effect. The sharp lines, angles and shadows around the eye sockets successfully compliments with the overall design that provides a unique perspective of the human skull. According to Benitez, the detail is the most important aspect and I agree, all the corrections create a very artistic appearance or characteristic. Benitez also explains that the “shading provides dentition to the makeup” and I believe that the shading is an integral part of the overall style. Click on the link below to view the video tutorial. I’ve recently discovered this interesting skull makeup tutorial by Catherine Nameless from Kosmetista, although I had to translate the text from Russian to English in order to develop a very basic understanding for the tutorial or article. I was able to follow the process through the photographs that displays Nameless’s unique ‘black and white makeup’ design. The shading around the teeth and the jaw line provides definition to the overall style and the photographs are incredible. While the eye sockets feature a shiny complexion or appearance, I believe that this particular element creates a unique appearance. 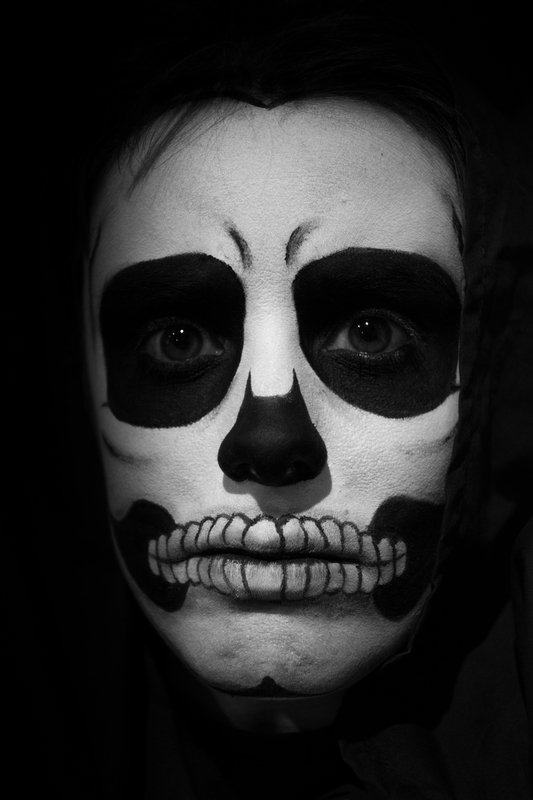 Catherine has used the black and white makeup in order to create the bones around the neck and the chest; all of the minor details do create a compelling image and the dark background emphasises the skull within the middle of the photograph. 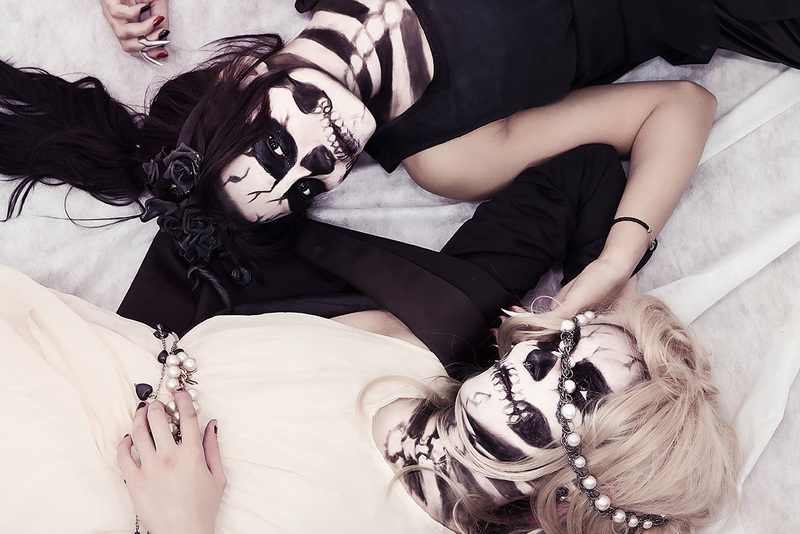 At number four, is Gregory Martins’s unique, yet inspiring photo shoot featuring two female models wearing some black and white skull makeup. I admire the cracks around the eye sockets and the forehead, these elements do create a very interesting image. The makeup does appear smudged, although this particular effect does provide a distressed appearance as well as a personalised style. The makeup is emphasised through the white backdrop, the jewellery and the costumes, although there is one particular photograph that I find absolutely captivating. One of the images features a close up shot of a model with some jewellery draped across her head, although I find myself fixating upon her bright, brown eyes as well as her nose / lip piercings. From my personal opinion, Gregory Martins has successfully captured the subject’s personality and her hair does create a sense of movement. To be honest, I do admire all of the images from Martins’s collection or photo shoot, I would highly recommend clicking the link below to view the entire series. 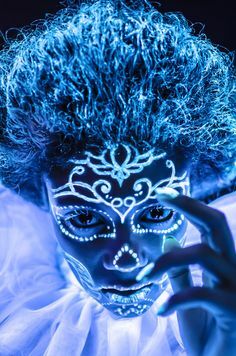 I have discovered this particular image through the Skullspiration website in a post known as ’40 Halloween Skull makeup Ideas’ and I was immediately surprised when the subject opened his eyes, I’m assuming this is an animated gif. 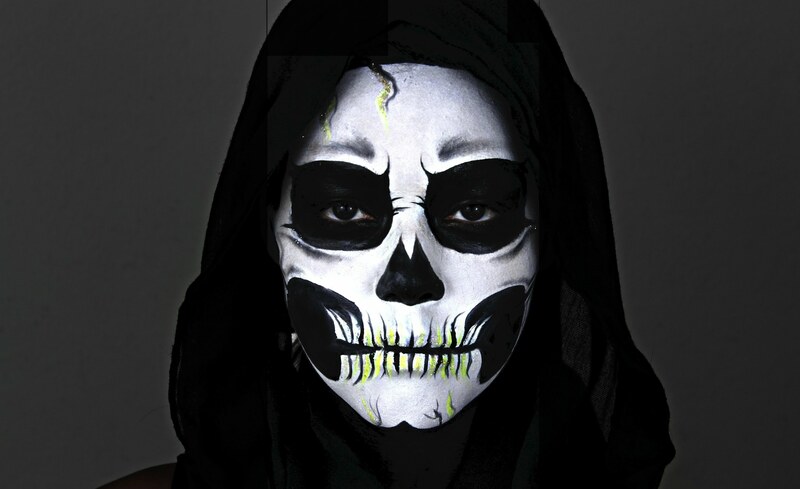 At first I struggled to search for the name of the makeup artist, although I finally discovered that the fabulous black and white skull makeup is created by Sandra Holmium and her blog features some very artistic or creative designs. I do love the shadows and the shading around the lips, jaw line and cheek bones; these particular elements appear realistic. The black and white photograph appears rather creepy, sinister and distressed, this definitely achieves a death-like appearance. So here is my top five favourites, there are so many different designs, styles and effects that I find inspiring! I will post some of my own skull makeup designs in the next few weeks, I haven’t practised for a few years, although I do have some free time over the holidays to practise and the opportunity will provide some invaluable experience! I personally believe that the skull has become an area of fascination, although It’s difficult to determine whether the skull is viewed as another popular image or do we view the skull as something quite meaningful, spiritual or even frightening? Only time will tell, this is a subject that I will explore in further detail during the summer holidays. I’m fascinated with the various styles, as well as the artistic depictions of the skull, they’re all so different from one another. If the makeup designs were all perfectly smooth, I believe this would defeat the purpose or the intention to appropriate death all together. 17/1/13 – Do the Black and White Photos Appropriate Death? 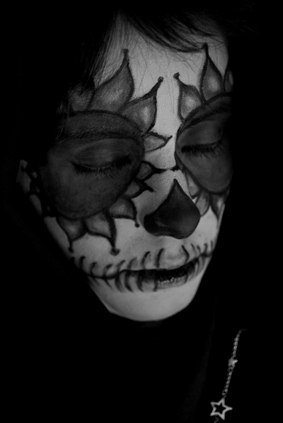 So I have been replicating the sugar skull imagery through the application of makeup and face paint. In these series of self-portriats, I have decided to stand in front of the mirror and take photographs of myself with the face paint. This process is easier then extending my arms in the air in order to take a photograph; I do actually have a tipod but for some reason, I can’t achieve the same results. I don’t really use the tripod for my own self-portriats, I often like to experiment with various angles and compositions. Just holing the camera is easier than using the tripod; I just keep taking the photographs until I find at least two or three that I am pleased with. The photographs are inspired by Australian photographer, Sue ford who exhibited 47 black and white self-portriats at the Monash Gallery of Art in 2011. Ford’s most important works, including ‘Self-Portriat with Camera’ examine’s the artist’s own identity and self image. It is interesting see the artist ageing through her own self-portriats; In a way, photography does take you back in time, photography documents a younger version of the self. It is quite a strange feeling when I look at myself in my self-portriats; the person in the photograph isn’t the same person I am today. I am constantly ageing, each day is another step closer to death. This particular idea questions whether the living body is dying each day? In a way my portraits represent death; they represent a person that no longer exists. I’m older than the person in the photograph, I’ve actually aged since I have taken the photograph, I am no longer the same person that I used to be. The self portraits have invited to explore my own interpretations of life and death. While the photograph documents my own presence, my own physical existence, my bodily being is permanently absent. Is absence an indication of death? I’m still trying to think of an answer for this question, so stay tuned! Enjoy the photographs! So I have decided to add some more work in progress photos. There was one afternoon, where I did have some free time so I decided to take 387 photographs. 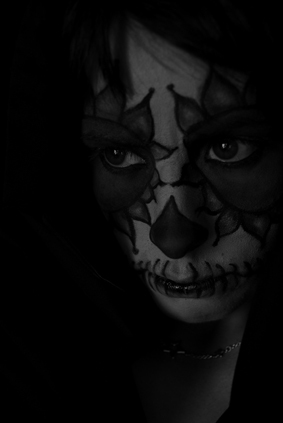 The sugar skull makeup does take a few hours to complete and I just keep taking photographs until the sun disappears. I have decided to darken the photographs; this particular effect intensifies my own personal connection to death. For some reason, I always associate death with darkness; I then begin to wonder how the living body becomes a decomposing corpse. Once the body dies, I believe that the body submerges into complete darkness. 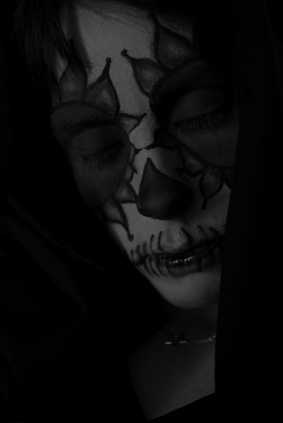 My favourite image so far is the one with black and white sugar skull; the skull becomes the main focal paint within the image that contrasts with the makeup as well as the dark backdrop. The skull does capture my attention immediately as well as the various patterns and designs. 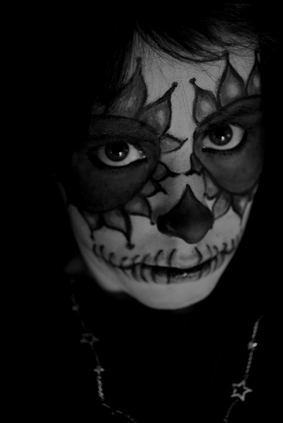 My face on the other hand appears to be submerging into darkness; the image does provide a very interesting juxtaposition between the actual sugar skull and the makeup. 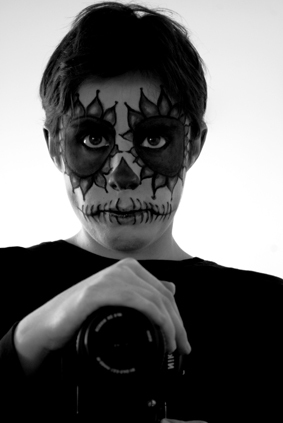 I must admit, I was quite difficult to photograph myself with an SLR camera in one hand and a sugar skull in the other. This particular idea did require quite a lot of patience in order to capture a clear image. throwing away the sugar skull, I decided to incorporate the mistake into the actual design. 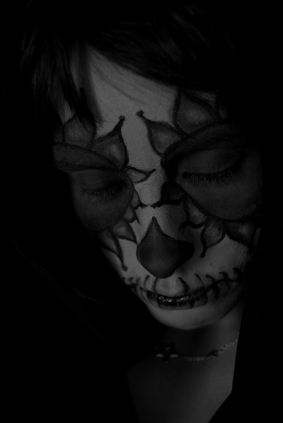 The skull does appear to be crying; this particular element does add an interesting effect to the photograph. Here are some more photographs for now, enjoy! 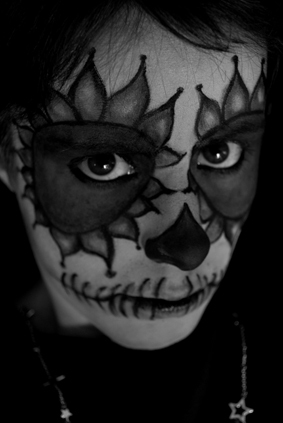 Last week, I decided to practise my makeup style for my own self portraits; over the past few months I have been using makeup and face paint in order to replicate the Mexican sugar skulls. The black and white portraits were apart of my honours research project that explored my own personal interpretations of death. 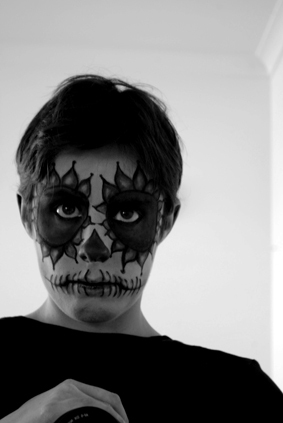 Throughout the project, I discovered that the absence of colour did impact my own emotional response to death; I then began to explore the way the Mexican Day of the Dead celebration differs from Western / European interpretations of death that is often considered as a subject of fear and anxiety. 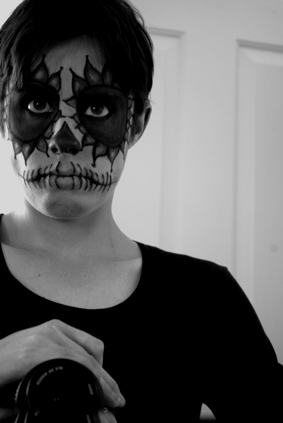 I’ve decided to continue with the project and I have used my sugar skulls as a source of inspiration. 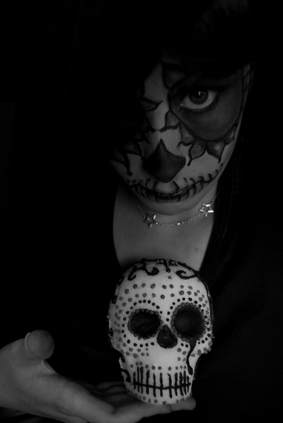 I have been making my own sugar skull moulds and decorating them with icing sugar; the blue and orange skull I had created has provided inspiration for my self portraits. I have replicated the floral patterns around the eye sockets; this particular design did contrast with the dark backdrop. So I did have a small problem while I was applying the makeup; my eye pencil actually snapped in half and I had to used a liquid eye liner to finish the job. The liquid eye liner was quite difficult to use although I did manage to complete the design towards the end of the day. Once I had completed the makeup, I decided to sit in front of the backdrop I have made for myself and I started to take photographs. So many people have asked…how do I take the photographs of myself? Well I have tried to use a tripod, for some reason the photographs never seem to work. So I just hold the camera and I continue to adjust the settings until I am able to take a photograph I am pleased with. The photographs are quite dark but that is what I like about them; it is the darkness that instantly reminds me of death.